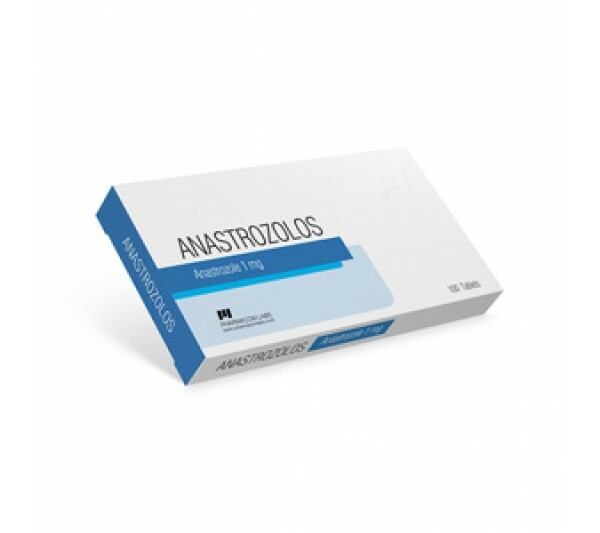 Anastrazolos 1 mg is a powerful antiestrogen that has an aromatase inhibitory effect, causing a decrease in the level and activity of estrogen hormones in the body. In sports practice it is used on heavy steroid courses, coupled with a real risk of estrogenic side effects. The drug has an active ingredient anastrozole. This is a selective aromatase inhibitor, an enzyme involved in the process of aromatization, the formation of estrogenic (female) hormones. Initially, anastrozole, like its analogues letrozole and vorozol, was developed and produced only for use in medicine: for breast (breast) tumors and other oncological diseases in women. Anastrazolos 1 mg (anastrozole) belongs to the third, last generation of aromatase inhibitors. Citrate differs from anti-estrogen tamoxifen and clomiphene not only by the power of the effect, but also by the mechanism of action (tamoxifen and clomiphene by the type of action are estrogen receptor blockers). Anastrazolos is not a steroid drug - it does not have pronounced anabolic, androgenic or progestogenic properties (but can indirectly, through feedback, when a decrease in estrogen levels leads to an increase in the level of androgens, contribute to anabolic and androgenic processes, decrease fat and remove excess fluid). How to take Anastrazolos 1 mg in sports? In sports, the described anti-estrogen agent (aromatase inhibitor) is used mainly by experienced athletes who use high dosages of steroids susceptible to aromatization during long courses. At the same time, the use of such a drug for sports purposes is recommended only for men, women usually do not resort to its help because of the risk of undesirable consequences (side effects). How to take PharmaCom Labs Anastrazolos? There are two fairly effective schemes for its use. The first scheme is the use of pills when the primary signs of aromatization have directly appeared (taken in dosages from 0.25 mg to 1 mg on a daily basis). The second is to take the drug from the start of the steroid course in small prophylactic doses in order to prevent the development of side effects. As reviews of Anastrazolos 1 mg suggest, the effect of this remedy differs from clomiphene and tamoxifen, which are popular in the anti-estrogen industry. It blocks the very process of flavoring, the formation of estrogen, which leads to a decrease in their content in the body. However, this may be associated with some consequences, in particular, with the deterioration of the production of “good cholesterol”, which in turn can cause cardiac abnormalities (therefore, the drug is not recommended for athletes who have ever experienced heart problems). Also, reviews of Anastrazolos 1 suggest that this anti-estrogen is superior to even the most popular combination of Proviron (Mesterolone) and tamoxifen. In addition, it has a fairly fast action: the maximum concentration of the active substance is usually observed within a few hours after ingestion (an average of 2 hours).